If there is anything that makes a drum part great is energetic, steady but relaxed reel. There are certain aspects to develop and be aware of while you play, practice or record in a studio. I like to compare it to your grandma’s cake and the way she prepares is. The wisdom of her being focused doing her best for you and still staying relaxed is what you should apply to your drumming. Developed specially for all Single Stroke subscribers! 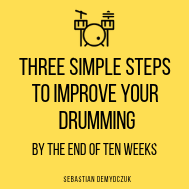 It will instantly increase your control and ease playing drums! Get the three simple steps here! You have Successfully Subscribed! Please, check your mailbox!